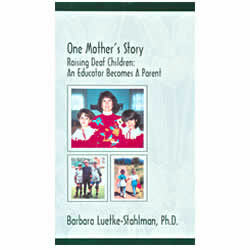 Dr. Barbara Luetke-Slahlman is the mother of four daughters, two of whom are deaf. In this book, she tells the story of raising Mary Pat and Marcy, and how her whole family has been enhanced by the opportunity. Barbara tells of her struggles and joys in a way that will encourage us all to work together to improve deaf education in the years to come. 106 pages.